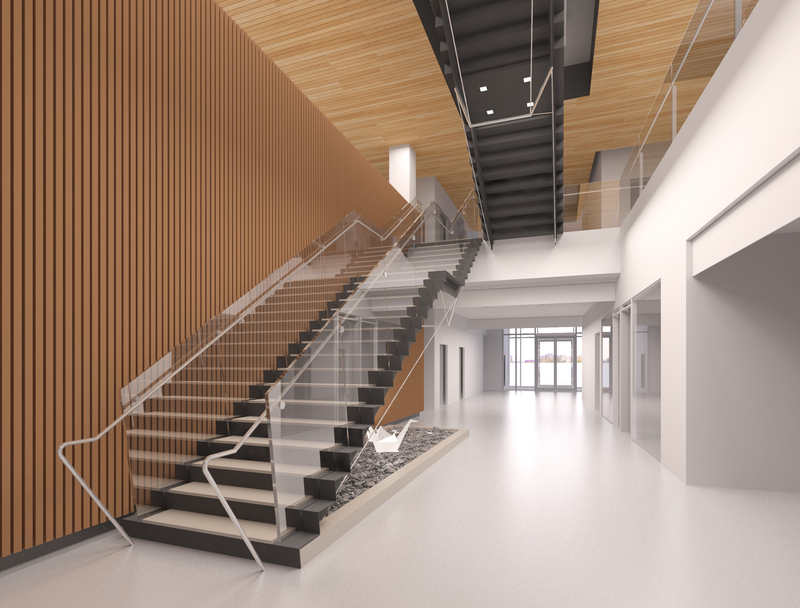 Targeted for completion in Fall 2019, Sweeny&Co Architects is providing full architectural design services for the new building and interior spaces. The design team is working closely with the client to organize their existing 34 departments, also building solutions that will accommodate their expanding workforce. 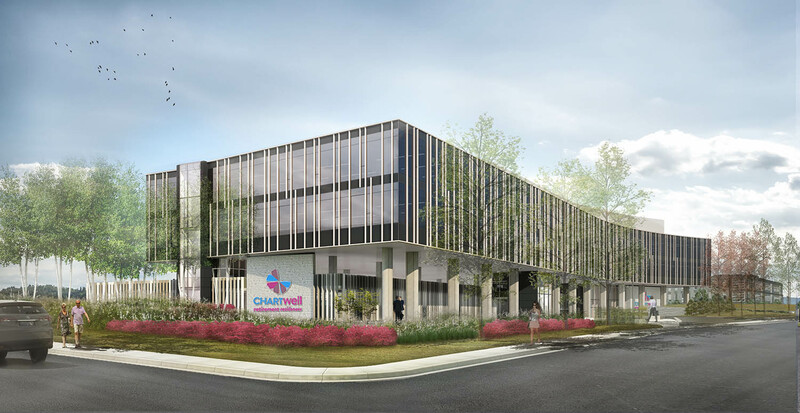 The new corporate head office for Chartwell Retirement Residences, this project is located in Mississauga, near the intersection of Hurontario Street and Derry Road. Situated within the growing Gateway Area Employment District, the property backs onto Fletcher’s Creek and neighbouring Derrydale Golf Course. Taking full advantage of its surroundings, Sweeny&Co has oriented the building to frame striking vistas to the adjoining natural area. 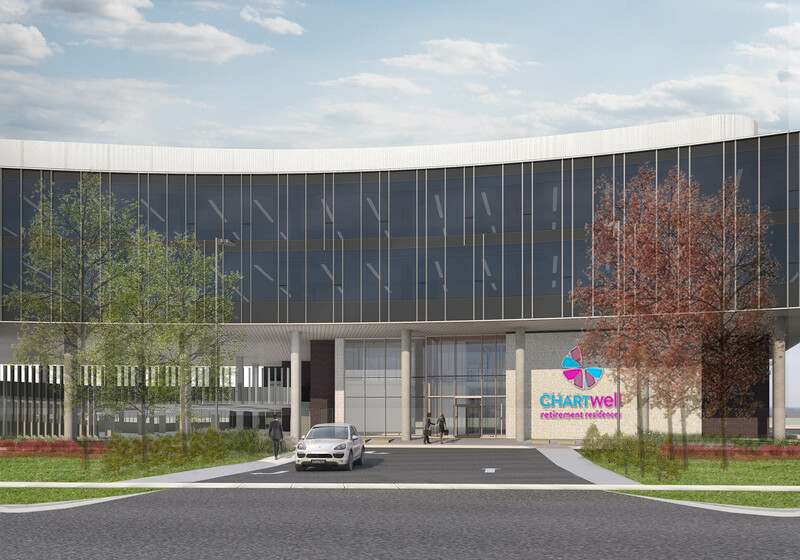 At 130,000 square feet, the four-storey headquarters elevates two large office floor-plates across a two-storey above-ground parking structure and a two-storey multi-use facility known as the Hub. The Hub includes distinct spaces to accommodate meetings, lectures, and computer training as well as a teaching kitchen. These Hub spaces are complimented by amenities connected through a grand interior feature stair. These include: a two-storey cafeteria and servery, a private fitness and exercise studio, an outdoor amenity and a rooftop terrace. Floor-to-ceiling glass all around the office floors ensures maximum views out, and automatically-tinting windows reduce the effects of heat gain throughout the day, without losing visibility to the outside. The above-ground parking structure, located adjacent to the Hub, below the large office plate, has allowed the project to reduce the amount of surface parking on the property in favour of a more naturalized, landscaped garden for employees to enjoy, including a walking path.